We all know Dark Horse Comics is publishing The Final Quest, as well as at least two, huge, black & white graphic novel compilations of the EQ back catalog, called The Complete Elfquest. Lots of folks have been asking if there will be color graphic novels, if the back catalog will be offered digitally, if there will be statues, action figures, etc. Well, you can let Dark Horse know exactly what you want to buy. 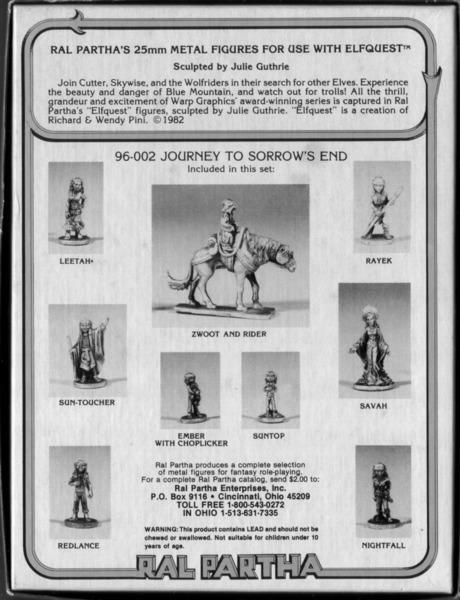 And the more of us that do, the more likely we'll get the Elfquest products we want. Send Dark Horse a tweet here. Contact Dark Horse via Facebook here. Contact Dark Horse via Google+ here. Email Dark Horse specifically about Elfquest at elfquest@darkhorse.com. I'd love to see some new action figures, maybe some figurines (statuettes; or whatever they're called), posters, prints; etc. I'd also like to see t-shirts, but I don't know if Dark Horse does those. @WhitewolfStormrunner, be sure to use the links I posted above to tell Dark Horse directly, because they're not reading this forum. As for t-shirts, you can get them from either We Love Fine or from Cafe Press. There are lots of designs available. We Love Fine already has some cute apparel. I just want posters, huge ones. I'm an art hoarder. I sent my requests already and plan on contacting Dark Horse more than once. I also requested a lunch box. Seriously, their one for Avatar is great and I have always wanted one. I run the risk of getting Dark Horse to ban me at this point, but I will keep sending them messages about Elfquest. Thornbrake said: I run the risk of getting Dark Horse to ban me at this point, but I will keep sending them messages about Elfquest. I know the feeling! I might be getting a cease and desist letter any day now! We'd advise anyone who wants WeLoveFine Elfquest shirts or other merchandise to strike while the iron is still hot (or even warm). There have been some changes at the company and we don't know how those may affect the Elfquest license. Also, the Cafepress store is still open. Man did we spill a lot of coffee on the old mousepad. I mean, my god. How about a new updated iteration of the ElfQuest role-playing game? I would definately buy that! Maybe it could be done with Kickstarter? shadryx said: How about a new updated iteration of the ElfQuest role-playing game? I would definately buy that! Maybe it could be done with Kickstarter? If you want it @shadryx, you gotta tell Dark Horse directly. They're not reading this forum. I'm interested in a continuation of the "Blood of Ten Chiefs" novels; would that fall under Darkhorse's purview? LauraHeffner said: I'm interested in a continuation of the "Blood of Ten Chiefs" novels; would that fall under Darkhorse's purview? Not at this moment. Dark Horse doesn't publish prose works, far as we can tell. We're investigating other avenues for that (both the books that already exist, and new ones). @ Mr. Richard Pini, I really, really hope that those plans come to fruition. That is an EXCELLENT series (As is anything Elfquest related). Please let us know if letting a prospective publisher know of our interest in a continuation of that series, like we're doing for Darkhorse produced Elfquest products, would be of assistance. For any of you interested in an ElfQuest tabletop RPG, we (Cheeky Dingo Games) are tinkering with some versions of making this a reality. But in the mean time, we are launching the Kickstarter/pre-orders for the EQ Adventure Card Game tomorrow (Sunday, July 13th!). That is such exciting news! So glad to hear it! This is excellent news! I know I don't need to say it, but I will buy any new Blood of Ten Chiefs novels. The five that exist are pretty amazing. Thornbrake said: This is excellent news! I know I don't need to say it, but I will buy any new Blood of Ten Chiefs novels. The five that exist are pretty amazing. Ooh, Ooh, I want Calendars!!!!! EVERYTHING!! LOL!!! Seriously though I would like to see it when I search for books on kindle or google, body wear (anything you could wear from top to bottom, clothes, jewelry, shoes, hats and hair), temporary tattoos would be great, Stuffed animals!!!! What I would personally love to have is a tattoo drawn by Wendy!! Some artists can do a good job but she is elf mom. To have something so personal would be the best thing ever! I love the Comic obviously! but i also like the mouse pads, jewelry EQ style would be awesome, i loved the bearclaw necklace, also it would be awesome if you could do costumes for cosplay and Halloween, for kids and adults. The maggoty apron is one of my favorites and i also love the blankets and sheets. Laptop or tablet decals would be awesome too! It would also be cool to do certian items from the story... the little palace, egg, Maggotys dreamberry skin or mug, maybe incense burners with EQ themes.... I have to wait for my birthday to get most of the new comics but i can't wait!! I am so behind! 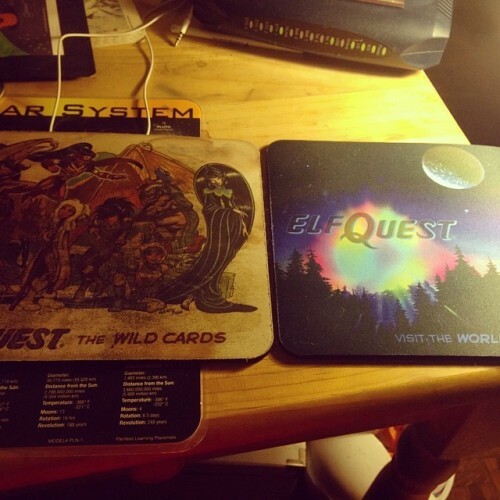 For what it's worth, the Elfquest shop on Cafe Press has mouse pads, aprons, and mugs. I also have the business card for a jewelry shop that dabbles in fantasy, and they're starting an Elfquest line; they'd be stoked to hear what you want specifically. :) I chatted them up a little at Phoenix ComiCon. I'll dig the card out in a bit. Tam said: Just make sure you tell Dark Horse directly what you want! Posting here isn't enough. Indeed! I just emailed Dark Horse letting them know that I'd buy more EQ graphic novels, action figures and coloring books. :ar! What have you all asked Dark Horse for? RichardPini said: Not at this moment. Dark Horse doesn't publish prose works, far as we can tell. We're investigating other avenues for that (both the books that already exist, and new ones). OMG! Richard I just geeked out! This is turning into an ask Santa...lol.. I asked Dark Horse for Elfquest prints, busts, posters, and general merch to buy for myself and for other fans as gifts! Hm, this is an interesting question. Personally, I'd like posters and mousepads. Maybe even official champagne. One hell of a pipe dream there. A note to let you know that fans are eager for a full-colour, completely inked, and logically, well-sequenced set of volumes of the entire Elfquest series. As a publisher myself, I know cost, licensing, and copyright may be issues for Dark Horse, but from a fan and collector POV, what exists in print remains piecemeal and disappointing after a certain point. Perhaps when Final Quest is done...? There's an audience for sure. I'm not buying the new Gallery Editions because I already own beautiful full-colour editions of earlier stuff (and the original B&W comics, both Warp and Marvel). Instead, I'm waiting for the full meal deal, in full colour, like so many readers. Sunshade said: I'm not buying the new Gallery Editions because I already own beautiful full-colour editions of earlier stuff (and the original B&W comics, both Warp and Marvel). Instead, I'm waiting for the full meal deal, in full colour, like so many readers. I emailed them asking if they had or were going to reprint The Complete Elfquest Volume 1 with the pages fixed. They never got back to me. Can we all just bombard them with this question until they answer? I like that idea @Manga! I will let them know! Does Darkhorse make patterned fabrics? I think they are more likely to be into making collectible toys and whatnot. They don't own the license for EQ, right? Wendy and Richard could strike a deal with a fabric maker, the same way they did with the t-shirt company. lunakat said: Does Darkhorse make patterned fabrics? I think that's probably beyond their scope, but doesn't hurt to demonstrate to them how eager we are for EQ stuff. 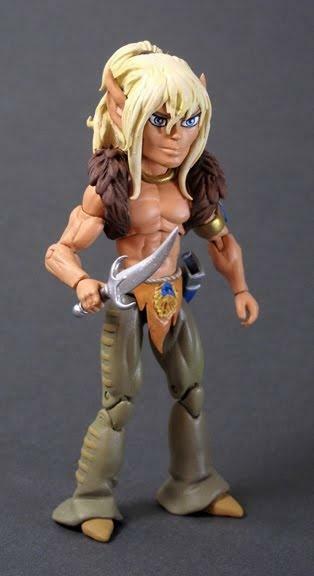 Who wants Elfquest action figures? Let Dark Horse Comics know by posting on their Facebook page, tweeting them at @darkhorsecomics or by emailing elfquest@darkhorse.com. Let your voice be heard! I've asked Dark Horse for library editions of all things Elfquest just like their Hellboy work. Does anybody know if they reprinted The Complete Elfquest vol 1 with the page corrected? I've not heard that they did, but I'll rattle the cage. They just emailed me back this morning. They said the reprints should already be on the shelves. I'm excited to buy one- next week for sure! That's great news indeed! Would you mind sharing their response to you on Facebook @lunakat? Lots of people there would be very interested to know this. There's an Elfquest thread on Dark Horse's Facebook page that is picking up some steam. Take a sec to go there and like it and leave a comment. lunakat said: They just emailed me back this morning. They said the reprints should already be on the shelves. I'm excited to buy one- next week for sure! Hey @lunakat - Can you share what they wrote with us? I've emailed them about this several times but haven't ever gotten a response. I'm mostly curious to know if the misprinted stock was recalled and replaced with the correct version, so that if we order online or buy a hard copy in a bookstore, we can be sure it's the corrected printing. Versus the misprint stock still being out there on the shelves/in inventory until it sells out. Curious if they addressed that in their reply to you. To say it with modern words: "*waaant*"
Also this one might want some more comrades. I admit that I did not yet find the time to assemble and paint him. If I remember correctly, there was one even larger statue of Cutter around. And then, there was that "action doll" run of ... um, uncertain quality. The sculpting was nice but the final product wasn't as great. The run contained Cutter (obviously, again him), Leetah, Tyldak and ... um, Picknose? Was it Picknose? I only got my hands on the first two. Problematic was that they would easily topple over and not stand in place. Don't ask me how I convinced Leetah to stand for the photo and not fall over like a drunken lady. That was a bit unfortunate. Finally Rayek, even tough these figures are tiny. Anyway, if Dark Horse is open to listen / read, I shall write them a few lines. jaRf said: But then, why, again Cutter? I finally want Rayek in my collection! jaRf said: Oh, wow. This is a new one. Haven't seen him before. Where does it come from? 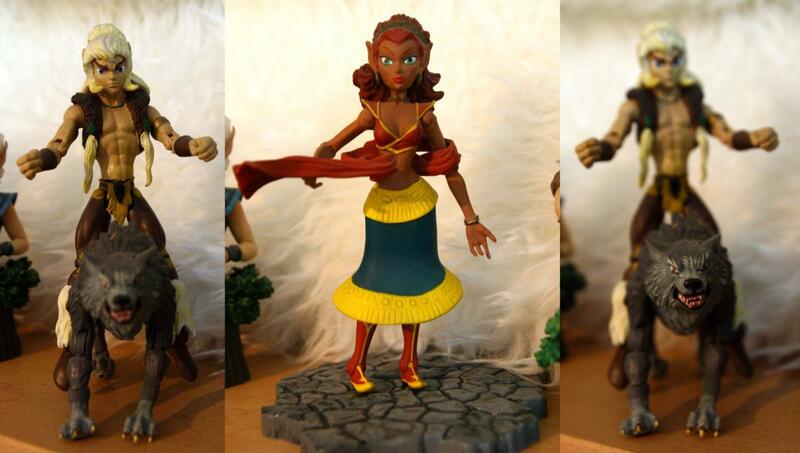 Yes, this Cutter action figure is fan art. There's a Skywise one too. Remember, this thread is about telling Dark Horse we want them to produce stuff like this, so if you like this, make sure to email them at elfquest@darkhorse.com. Should correct myself: It's absolutely stunning fan art! I know what I want! I want the Dark Horse comic app available on the Windows App Store. I've got a Windows Tablet (Surface 2). It's not an iProduct and it's not an Android... and I REALLY want to be able to have the digital copies available to read even when I can't reach teh Internetz. So... can someone put a preserver in someone's ear? MrsGrizzley said: So... can someone put a preserver in someone's ear? Email Dark Horse directly at elfquest@darkhorse.com and let them know. manga said: You know what I want? Patterned fabric! I've got friends having babies and I want to make EQ-themed baby blankets. I'm sure there are other crafty fans who'd like to make neat things too. You can make things out of smart fabrics with EQ. Not only the bed , but also dresses , tunics, even an evening gown . Would be a fantasy. And tissues. marinayurk said: You can make things out of smart fabrics with EQ. Not only the bed , but also dresses , tunics, even an evening gown . Would be a fantasy. And tissues. I don't quite follow you, Marinayurk. "Smart fabrics?" I don't need a nightgown with wifi. ;) I suspect also that you mean nightgown instead of evening gown. In English, a nightgown is a dress-like garment that you wear to sleep. An evening gown is a long, fancy (usually expensive) dress like the kind the Hollywood folks wear on the red carpet. Maybe it could be stylish fabric instead of smart fabric ? Ah, smart as in stylish. I could see that. Aren't our lives wired enough already, though, Lunakat? There are certain characters I would really like to see a figurine of. I may even try my hand on doing a bit sculpting...As we have already seen Cutter, Skywise and Leetah, I would love to see Winnowill and Rayek. Elwing said: I may even try my hand on doing a bit sculpting.. Think that you want. I won't receive anything anyway. Elwing said: As we have already seen Cutter, Skywise and Leetah, I would love to see Winnowill and Rayek. Yep. 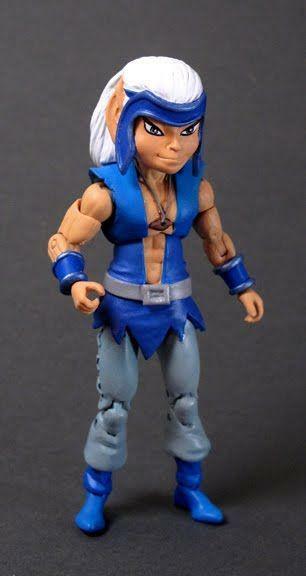 And so many other characters of Elfquest's rich universe. I often say if you want something to happen you have to take it in your own hands. Do for yourself and don't wait for the world to do it for you or to magically happen. Sadly I lack skill for sculpting and currently the time to learn it. I wrote an email to Dark Horse Comics about possible merchandise and devotional objects I could imagine. I'm actually quite tempted to have a go at Winnowill. I'm looking into obtaining the right materials now. I will need a good quality two component epoxy clay like magic sculp or apoxie. Not something they sell in the shops around here. I have an "evil plot" involving Rayek, yarn, crochet needles and some patterns I bought off of Etsy. If all goes well, I may have a stab and making a "set." Do we have a thread already for sharing our EQ crafts? manga said: Do we have a thread already for sharing our EQ crafts? There must be something like that in the Fan Art & Fiction category. And if not, there's always the "New Discussion" button. Oh and there is something else I would love to buy: the finished Elfquest tarot deck! Elwing said: Oh and there is something else I would love to buy: the finished Elfquest tarot deck! Wendy did ... at least she started with some cards. I would love to see Khavi as the Queen of Swords. I actually think he'd be a better Magician card than Skywise ...but to each his/her own, I guess. Actually, come to think of it, Two-Edge would've also been a great Magician card. Two-Edge is on the Magician card. Look in the stump under Skywise. ^ Heh. Thanks for pointing that out! The 'shadow' aspect to the cards is pretty neat. Kind of upset Shenshen isn't reflected back as the Empress though....she would be great!!!! Well it's interesting that Wendy used Skywise as the Magician. What would Rayek be? The Sun? Death (which is not as bad as it sounds in Tarot) The Hanged Man? I'm not a believer or anything, but there is just so much interesting imagery there. Two-edge would be a good Hanged Man as well! Death would be.... gosh, I kind of imagine wrapstuff or the whole thing with One-Eye and Clearbrook about death being a new kind of beginning. Rayek would make a good Hermit. With Ekuar of course. I've always seen the Hermit card as the card of the teacher and mentor, and I thought being a mentor of some kind would be Rayek's highest potential. Always two there are, a mentor and a student. ("Star Wars" reference for our ESL friends here.) I think it should be Ekuar and Rayek because if Rayek does prove good at that, then it's because of Ekuar's influence. Though I'd seethe argument for other elves too, like Savah and Sunstream. Is there a good explanation about Tarot cards somewhere on the net? Waah. Why did I not know about this? Anyway it was very successfully funded. I wonder when there will be something ready for shipment. jaRf said: I wonder when there will be something ready for shipment. "The ElfQuest Games have arrived on US shores. They are being held up by random customs inspection but will then be winging their way to the import station and then to us and our distributor. We have no specific information as to how long this will take, but a week or two is probably realistic." I was always HIGHLY disappointed when the one comic that featured a piece done of Skywise did NOT include the pattern in it. Ok, so I've emailed and Facbooked them before with ideas... Has anyone seen any movement? I know they can't jump on everything but so far I don't think I've seen anything new come out. Maybe they are still busy with my lengthy email. ;) I don't know how much email hits them but maybe they will collect ideas and then give some kind of conclusion and tell us what they think can be brought to reality.